Even people around the US debate about Pakistan, its history, its political struggles, and whether helping will increase US popularity in Pakistan, citizens in and around Pakistan have taken matters in their own hands and are working around the clock to reach those in need. In Karachi, Pakistan’s largest city and closest to flooded areas in Sindh, a non-profit Designers United for a Cause have teamed up with students at the Indus Valley School of Art and Architecture and have initiated a poster campaign through which they are raising funds and transporting items to flooded areas. The Koel Gallery held an on-line silent auction of donated artwork and raised thousands of dollars. 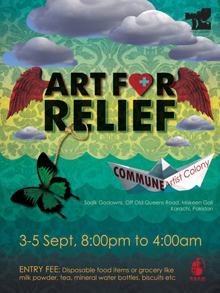 The Second Floor Café (T2F), an alternative artspace also in Karachi, held multiple events, all to benefit flood evacuees—even as the café struggles to survive in a rapidly inflating economy where food prices are soaring now that the country’s agriculture has been destroyed. Across the border in Mumbai, Lucknow, Delhi and cities around India, people are holding fundraisers and art auctions to help their neighbors in need. And around the US, the Pakistani Diaspora is taking action. In Houston, the Pakistan Association of Greater Houston has been collecting supplies and funds, as has been the local chapter of Helping Hands/ Relief for Pakistan along with many other organizations. Voices Breaking Boundaries is organizing a fundraiser through which the citizens of Houston can learn more about the flooding disaster in Pakistan and can learn how to help the citizens of Pakistan. We’ll have information about relief efforts and there will be opportunity to donate. Please join us.